Theis powered by Roku who is a big name in streaming box technology. Going this route gives you access to thousands of streaming apps and a user-friendly remote that has a simplified and easy to use design. Available from Costco and Amazon, this 4K tv is HDR ready and boasts an eye popping UHD screen. The TCL utilizes NBP Photons. It reaches 93% of the color specrtrum in DCI-P3 mode. 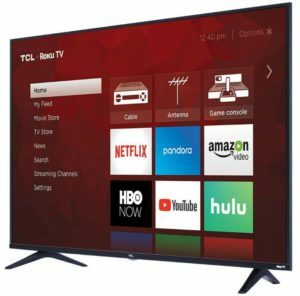 The amazing thing about the TCL is the price: Less than $650. The TCL competes with the almost twice as expensive Samsung Q6. With its very affordable price and minor differences (specifically, the remote is less capable), the [amazon_textlink asin=’B0798B2L5H’ text=’ TCL 6 Series’ template=’ProductLink’ store=’crwatchdog-20′ marketplace=’US’ link_id=’6b166eba-7bd6-11e8-9c24-61f6facb1560′] is an excellent buy.